The home secretary has accused Russia of using Britain as a "dumping ground for poison" after a second incident involving the nerve agent Novichok. Charlie Rowley, 45, and Dawn Sturgess, 44, collapsed at a house in Amesbury, Wiltshire, on Saturday and remain critically ill.
Sajid Javid said the agent was similar to that used on ex-Russian spy Sergei Skripal and his daughter in March. Russia said Theresa May's government was subjecting them "to hell". Russian foreign ministry spokeswoman Maria Zakharova urged police not to be led by the "dirty political game" and said she was confident London would have to apologise to Russia. In a statement to MPs, Mr Javid said: "It is now time that the Russian state comes forward and explains exactly what has gone on." He said the "strong working assumption" was that the couple came into contact with the nerve agent in a different location to the sites which had been part of the clean-up operation in near-by Salisbury after the Skripal poisoning. "It is completely unacceptable for our people to be either deliberate or accidental targets, or for our streets, our parks, our towns, to be dumping grounds for poison," he added. He said he could not rule out the possibility that the Novichok found in Amesbury was from the same batch used in the Salisbury attack. "We cannot attribute this to the same batch at this point and scientists will be looking into that," he said. "I'm also told that may not even be possible because of a number of factors, but we cannot rule out, of course, that it was from the same batch." Earlier, Mrs May said it was "deeply disturbing" to see two more people exposed to Novichok in the UK, and the police would leave "no stone unturned in their investigation". On Saturday, paramedics were called twice to a house in Muggleton Road in Amesbury - first at 11:00 BST after Ms Sturgess collapsed, then later the same day, after Mr Rowley also fell ill.
Wiltshire Police said it was initially thought the two patients had been using heroin or crack cocaine from a contaminated batch of drugs. In the early hours of Wednesday police declared a "major incident" after revealing the couple had been exposed to an "unknown substance". By late that evening, Scotland Yard said Novichok was to blame following analysis at the defence research facility at Porton Down, Wiltshire. What do we know about the couple's movements? Partners Charlie Rowley and Dawn Sturgess spent Friday afternoon and evening visiting shops in Salisbury, the city where Mr Skripal and his daughter were poisoned. The following day Ms Sturgess, who is understood to be a mother of three, was taken away on a stretcher by an ambulance crew. Her friend Sam Hobson said she had appeared to have a fit and was "foaming at the mouth". Shortly after, Mr Rowley started "rocking against the wall", said Mr Hobson. "His eyes were wide open, glazed and pinpricked, and he was sweating, dribbling and making weird noises." Mr Hobson said the police and firefighters were in "hazard suits" and "cordoned it all off". Ms Sturgess' father Stephen, 65, told The Times the family found out from TV news that she may have been poisoned by a nerve agent. "We heard from the hospital on Sunday, and we gave them Dawn's GP details but we didn't hear anything from the police. "We know as much as the next person in the street. We actually called the police station for information." Novichok, a nerve agent developed by the Soviet Union in the 1970s and 1980s, takes effect within minutes, blocking messages from the nerves to the muscles. This affects breathing, can cause paralysis and lead to the collapse of bodily functions. There are antidotes to help reverse the chemical effects. It acts quickest when ingested or inhaled and more slowly when contact is made through skin exposure. Novichok is designed to be persistent - it neither evaporates nor decomposes quickly. In March Mr Skripal and his daughter Yulia were found slumped on a bench in Salisbury - about 10 miles from Amesbury. They were critically ill in hospital for weeks but recovered sufficiently to be discharged: Yulia in April and her father in May. The highest concentration of Novichok was found on the Skripals' front door. The UK government blamed Russia for the assassination attempt but Russia has denied any involvement and accused the UK of inventing a "fake story". The most likely hypothesis was that the Novichok was left over from the attack on the Skripals, says BBC security correspondent Gordon Corera. Mr Javid said this was the "leading line of inquiry". Metropolitan Police Assistant Commissioner Neil Basu said they could not confirm whether the nerve agent came from the same batch but the possibility was "clearly a line of inquiry". There was nothing in the couple's background to suggest the pair had been targeted, he said. His officers are examining the couple's movements to determine where they were poisoned. So far no contaminated items have been found and the police say they have no idea what the nerve agent was contained in. Chemical weapons expert Richard Guthrie said it was possible that the couple came across the Novichok which poisoned the Skripals after it had been disposed of "in a haphazard way". The risk to the general public remains low, says England's chief medical officer Sally Davies. However, she advises people who had been in the cordoned-off areas to wash their clothes and wipe down personal items. Residents at John Baker House, the supported housing where Ms Sturgess is believed to have been staying, have been evacuated and told they will have to be rehoused. The police warned members of the public against picking anything up if they didn't know what it was. Asked whether the people of Salisbury and Amesbury were at risk, security minister Ben Wallace said the "best intelligence officers in the world" were working on the investigation but until the full picture of the Skripal assassination attempt was known, he couldn't offer complete reassurance. 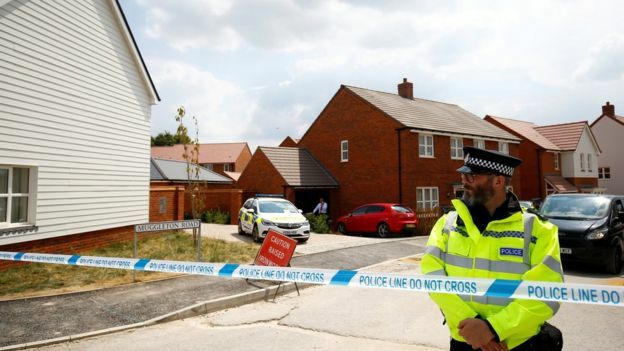 Sites in Amesbury and Salisbury believed to have been visited by the couple before they fell ill have been cordoned off as a precaution, including a church, park and chemist. This latest incident is likely to raise fears about the efficacy of a multimillion pound clean-up to decontaminate nine locations across Salisbury after the Skripal poisoning. What's been the reaction in Russia? There have been accusations of the UK persecuting Russia and failing to cooperate. The Skripal case is still shrouded in darkness, says Russia spokeswoman Maria Zakharova, as she called on Theresa May's government to stop the "dirty" games. She says Russia has sent "dozens of offers of cooperation". The state media in Russia are deflecting any suggestions of a Russian link to the new poisoning. Even before it emerged that the Novichok agent was involved, Wednesday night's primetime TV bulletins sarcastically said it was only a matter of time before Moscow gets the blame. State-run Rossiya 1 suggested it might have been staged by the British government out of spite over the "fabulous" World Cup hosted by Russia. NTV - owned by state gas giant Gazprom - called it "another dodgy story" from the Salisbury area, this time aimed at deterring fans from coming to Russia. Again, it added, the British had offered no detailed evidence: "Boris Johnson and British journalists will think up the rest." Channel One accused the UK of "dragging old skeletons out of the closet" to discredit Moscow ahead of President Vladimir Putin's upcoming summit with Donald Trump. "Groundhog Day. New Skripals in Salisbury. Really?" said its presenter. Is it Blay or Ntim as NPP goes to polls?